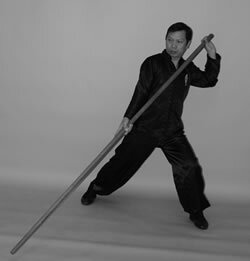 This staff form is one of the most famous forms in the Hung Gar Curriculum. The form was created by the fifth brother of the Yeung Family during the Song Dynasty. The fifth brother was particularly adapt in the techniques of the Yeung Family Spear. After his family’s army was defeated by the Mongols, he fled to Ng Toi Mountain and became a Buddhist monk. There, he converted his spear techniques into staff techniques and choreographed the Baat Gwa Gwan form. 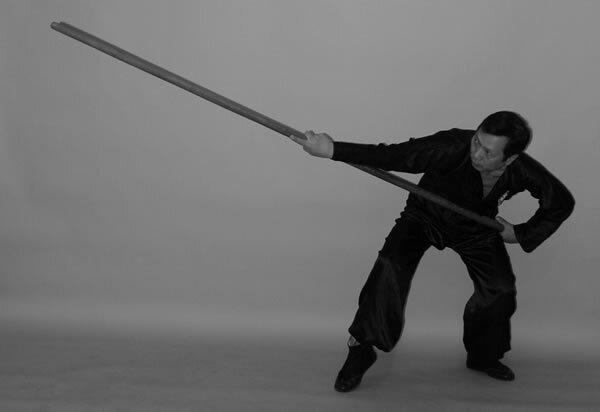 It is rumoured that GM Wong Fei Hung was particularly proficient in his use of the single ended staff. When the form was first passed to GM Wong Fei Hung, the form only had 64 movements. However, when the form was first passed to GM Lam Sai Wing, he added the Luk Dim Bun Gwan into this form. Therefore, in Lam Gar Hung Kuen Curriculum, the Ng Long Ba Gwa Gwan has 70 and a half rather than 64 movements. Huen Gwan (a.k.a Siu Wan Sing – Little Stars) – circling staff movements in both clockwise and anti-clockwise directions. The movement is executed to attack an opponent’s frontal grip hand. Yeung Cheung – an advance movement where by the practitioner evades an attack from the opponent’s staff by positioning the body to the side (Pin Sun) and counterattacks the opponent from the side. Ngoi Ba Gwa (External Eight Symbols) – a sideways swinging movement for attacking an opponent’s mid-section. Tai Gik Huen (Supreme Circle Staff) – a sideways swinging movement at head level. The practitioner spins the body in a full circle whilst executing this movement. This is the reason for the name of this technique to be “Tai Gik Huen“. The swinging movement is intended to add to the momentum of the staff to the Tarn Gwan at the end of the movement. Huen Gwan (a.k.a Dai Wan Sing – Large Stars) – circling staff movements in both clockwise and anti-clockwise directions. The movement is executed to control the opponent’s staff. Siu Gwan/Biu Gwan movement – the practitioner learns to deflect a straight staff attack from an opponent immediately followed by a spearing counterattack to the mid-section. Leung Tin Check (Ruler to measure the Sky) (a.k.a Loi Ba Gwa – Inside Eight Symbols) – a movement which is executed after a spearing attack to retreat from and evade an opponent’s counterattack and which immediately followed by a Kun Gwan (swinging downwards movement) to the opponent’s head. The movement is also known as Noi Ba Gwa because the strike is executed on the inside of circle. About the authors: Grand Masters Lam Chung Chung and LAm Chun Sing are sons of legendary Grand Master Lam Cho. Vincent Liu is a disciple of Grand Master Lam Chun Chung. You can find more information about Lam Family Hung Kuen at www.lamkahungkuen.com. I like being able to identify more for students with the traditions their exercises come from. I knew less about hung gar history as a student. Excellent article, thank you, Vincent, good job! great little article, lots of base information to utilize in understanding the weapon and its principal theories.